The summer snows on the Kamchatka Peninsula began to thaw last week just as the world press turned its spotlight on this oft-forgotten corner of Siberia. After the Russian news agency ITAR-Tass reported that two guards at the Koryakgeologia Mine near Khailino had been mauled to death by a rampaging gang of giant bears, the Associated Press picked up the story. Newspaper readers all over the world were left to gaze at the sordid headlines in bewilderment: Starving bears eat 2 men in Russia. The articles could have been written by the Brothers Grimm. Thirty bears had surrounded Khailino and Korf, two sleepy hamlets where scared villagers refused to leave their homes. Viktor Leushkin, a Khailino town elder voiced his concern that the bears had developed a taste for human blood and the government of the Kamchatka Krai province sent out a team of hunters and snipers to quell the ursine rebellion. Virginia climber Brant Holland made headlines this week for becoming the first person kicked off Mt. Everest and out of Nepal for carrying a “Free Tibet” banner up the mountain. 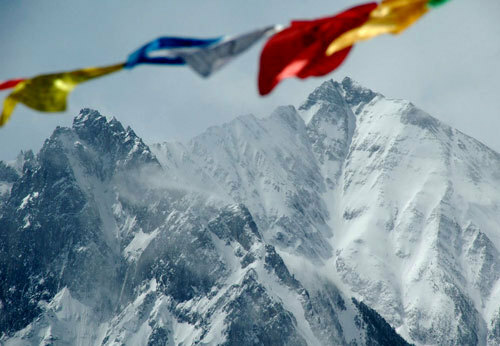 Chinese authorities, worried that the Olympic torch will be held up on its way to the top of Everest by protests over China’s role in Tibet, have closed access to the summit until May 10. Although Holland was climbing the south side, Nepal has been cooperating with China and has deployed army troops at Everest Base Camp. On Monday, Holland was deported. On Thursday, he spoke to National Geographic ADVENTURE West Coast Editor Steve Casimiro. A year from now, it will be impossible to repeat the eight-day rafting trip we just completed down the Great Bend of the Yangtze. This 120-mile section of the Yangtze, like many of China's rivers, will be dammed in 2009. It was amazing to experience this world-class stretch of whitewater before it changes forever. After we'd been in Tibet for two days, all travel was restricted and foreigners and nationals alike were prohibited from entering the province. No amount of negotiation would open the gate between us and our goal of kayaking the Upper Salween River. So we changed plans to try an undocumented section of the Mekong still within Tibet that, in 2004, a kayaker had allegedly soloed during peak monsoon. He had lost all of his photos and video from the trip, so this would be an opportunity to film it for the first time. 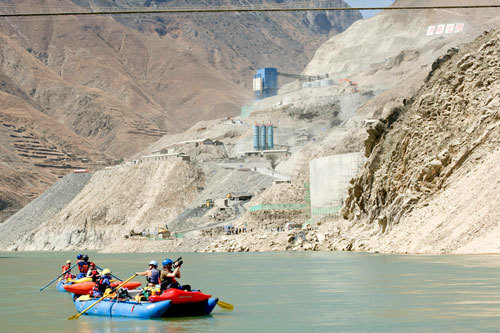 Amid the current political turmoil erupting across Tibet, last week the Rivers in Demand kayakers were denied access to the stretch of the Upper Salween River where they hoped to claim a first descend. And to their dismay, Tibetan checkpoint officials informed them that another, unknown expedition had put in on a first descent attempt of the river just days before. Frustrated and with their plans temporarily thwarted, the team, which includes Adam Elliot, Trip Jennings, Andy Maser, and Travis Winn, began to set their sights on new objectives. The crew settled on an equally ambitious undertaking: the upper reaches of the massive Mekong River. While one Australian kayaker claims to have run this epic stretch of high altitude, Class V whitewater—alone, even—several years ago, documentation of his feat has yet to be found. Regardless, this remote and dangerous area of the world will be filmed for the first time.